Welcome to the Crystal Vision videos page where you can find our recent videos. If you're thinking of buying a Crystal Vision product, these video demos will show you exactly what you can achieve, including walking you through each of the controls on our PC software. This three minute video, courtesy of our Spanish distributor Moncada, features Crystal Vision's Head of Sales Stewart McGhie introducing the MARBLE-V1 media processor and its software apps for converting between SDI and video over IP (SMPTE ST 2022 and ST 2110). Filmed in Madrid at the BIT exhibition in May 2018 and includes Spanish subtitles. SMPTE meeting video: Which standard should you use to pass media content over an IP system? What does a good up converter look like? Crystal Vision's up conversion comparison video clearly shows the difference in output quality between its Up-Down 3G and a lower cost alternative. 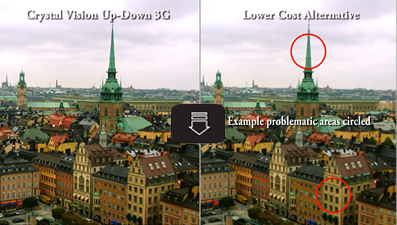 Download the minute-long video to see the difference for yourself, and you'll then understand why Up-Down 3G is the up/down/cross converter that broadcasters standardise on.